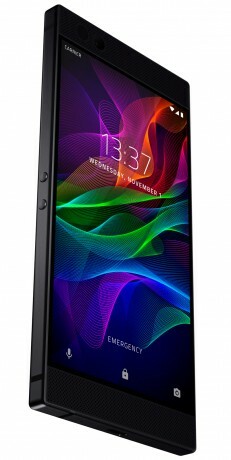 Razer today announced the Razer Phone, its first smartphone, with a focus on mobile gaming. The company bought NextBit, maker of the Robin phone, earlier this year and the Razer Phone was born from projects started at NextBit before the acquisition. The design is similar to the Robin in that it has a blocky shape and front-firing stereo speakers with independent amplifiers and a THX-certified DAC. The device boasts a number of firsts. To start, the 5.72-inch, wide-color gamut, IGZO LCD contains quad HD resolution and is the first display to refresh at a rate of 120 Hz (ideal for gaming). The Razer is also the first handset to ship with Qualcomm QuickCharge 4.0, an enhanced version of the rapid-charging technology. Razer is pushing the phone’s pixels and polygons with a Snapdragon 835 processor with a whopping 8 GB of RAM. The phone has 64 GB of storage and supports microSD memory cards up to 2 TB. As for the camera, the phone has twin 12-megapixel cameras with PDAF and a two-tone, dual-LED flash. One camera has a wide-angle lens with an aperture of f/1.75 and the other has a telephoto lens with an aperture of f/2.6. An 8-megapixel, fixed-focus camera is located on front. A 4,000mAh battery provides plenty of power to keep games running for as long as possible. The phone runs Android 7 Nougat. Preorders kick off immediately. The Razer Phone will go on sale in the U.S. on November 17. Razer's first phone is designed explicitly for gamers. Unlike some past efforts by other companies, this one looks like a normal phone. Nextbit said its planned system update for the Robin smartphone will begin going out over the air today. The update pushes the operating system to Android 6.0.1 Marshmallow and includes the April security update, and tweaks to the camera, processor, and sound drivers. Nextbit today announced via its official Twitter account that it is no longer offering customer support for its sole smartphone, the Robin. "Rebels, effective August 1st 2017, we will be shutting down support for Robin," said the company in its forums.